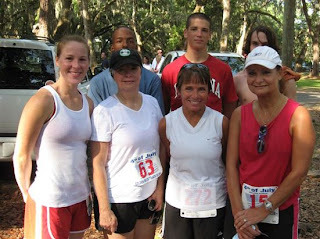 Seven Okefenokee Track Members participated in the St. Simons Island Fourth of July Sunshine Festival 5k. This was the 24th year it has been hosted by the Golden Isles Track Club. A record 400+ runners participated in this event. Front row: Anna Champion, Sharon Fulford, Mary Woodruff, Debbie Yawn. Back row: Trap Harrison, Thomas Deane, and Stephen McNally, members of the Ware County Cross Country Team.